Driving a brand new and hardly run in Midget, and despite a touch of the 'flu, Ian Woodside had a good win. 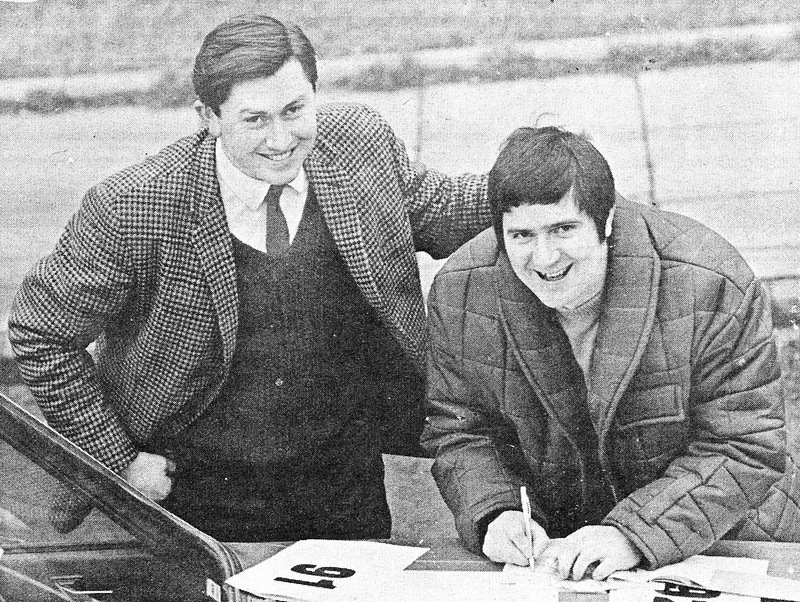 Motorweek January 3 1970 – Report and Pictures by Esler Crawford. 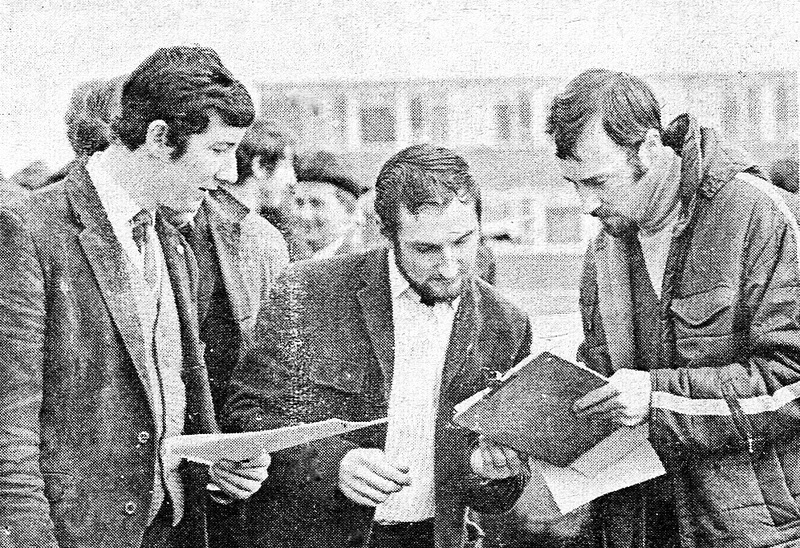 On the Saturday after Boxing Day (1969), the driving test scene moved West to Omagh where the local club ran their usual Christmas event. The venue was the army camp at Lisanelly where the parade ground with its smooth but gravel-covered surface provided a good site for six spectacular but non-car-damaging tests carried out two at a time. 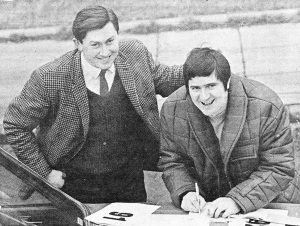 A cheerful Kenny Graham signs on late arrival Ronnie McCartney. This was quite a good idea as the competitors were able to watch each other in action and it was possible to follow the progress of the leaders test by test. However, it did seem a pity that Clerk-of-Course Mike Hart had not repeated last year’s very successful experiment of running an inter-club competition at the same time. Number one runner was Charles Crawford in his Midget. Charles seems to like this position and set the pace with 49.0 on the first test. However, Ian Woodside, in a brand new Midget, immediately pruned this down to 47.0 in a typically neat drive. Brother Robert came next, also in the Midget. That morning he had discovered that his normal Buggy was rather off-form – nothing, of course, to do with Reggie driving it the day before. 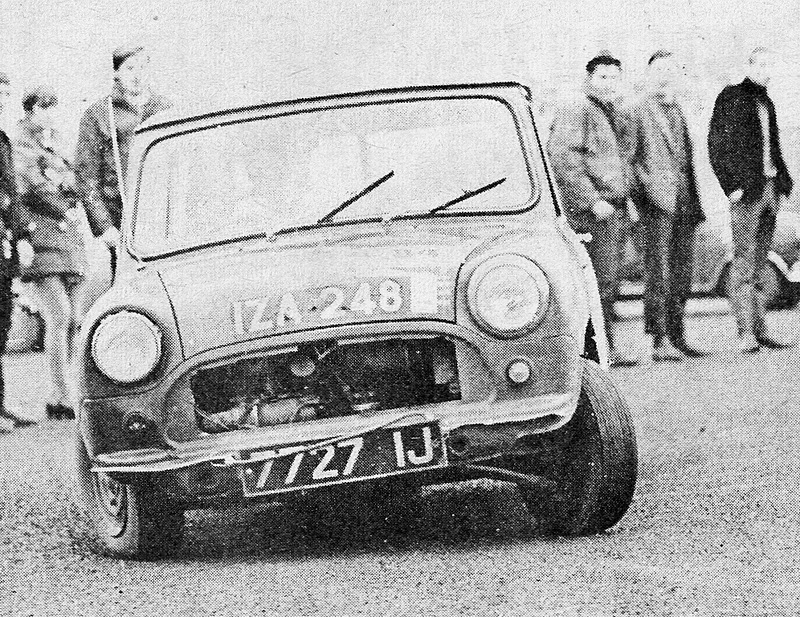 Alan Bridgham then volunteered the loan of his VW but this was found to be a bit short on handbraking power so the new Midget was pressed into a dual role. Despite not having driven a Midget in anger in a test meeting for three or four years, Robert did 45.4, but this looked less good when a ten-second penalty marker had been added on. 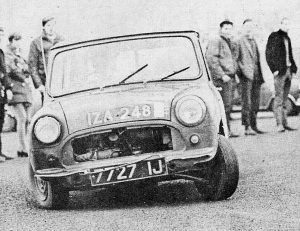 John McGauran’s Mini must pose a few problems at the border! Harold Hagan, as expected, had a good 47.8 and was followed by very throttle happy Norman Ferguson in 48.6. Charlie Irwin was slower than expected with 49.2 but Ted Hobson’s veteran 848 Mini was good with 49.6. 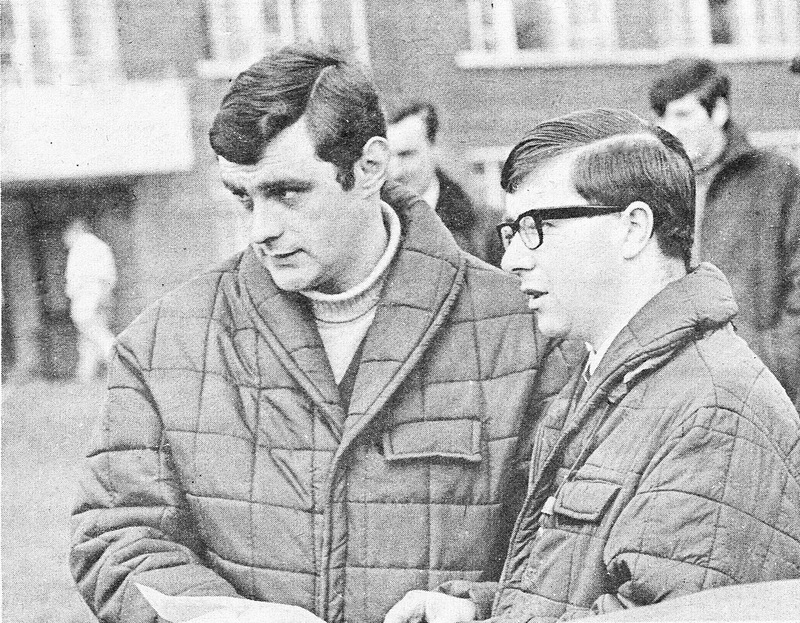 Then when everybody else had finished and the test was about to be changed, Ronnie McCartney arrived with his Cooper and after a quick spot of briefing from Robert Woodside got off to a reasonable start with 48.2. In test two Ian Woodside and Harold Hagan were out on their own with 35.0. Next best was Charlie Irwin with 38.3 followed by fellow Castlederg up and coming man John Lyons with 38.4 in his very neatly driven Wolseley Hornet. Amazingly Robert Woodside made the same mistake twice and clouted another pylon. Thus with two tests completed Ian Woodside led from Hagan with 82.0 to 82.8 Charlie Irwin was third with 87.4 _- a 0.4 advantage over McCartney -~ and the quiet man Ted Hobson was fifth. Ian Woodside continued his good work in test three with 29.8 and took another 0.4 off Hagan while Robert took himself in hand and equalled Hagan’s time. Charlie Irwin held his place with 31.0 but an off-form handbrake was contributing to Ronnie McCartney’s below par 35.6. Robert Woodside’s improvement continued in test four, a bit late of course, and he set‘ the bogey with 27.8 just 0.2 better than Ian. McCartney and Crawford were on 29.0 with Irwin 0.6 slower still, while John Lyons experienced the bitter taste of failure by doing the test incorrectly. lan Woodside was now in the lead with 139.8 to Hagan’s 143.0. Irwin had 148.0, followed by Crawford on 150.0 and McCartney was having trouble just keeping in front of Hobson. Test five was a really spectacular affair involving four high speed handbrake turns and at the same time very precise positioning of the car. Robert Woodside showed Why he is “King” by taking only 43.2 but Irwin once again demonstrated extraordinary neatness with 43.6 in his Cooper. Ian Woodside had 44.0, Hagan was 0.8 slower but McCartney was out of the running with 46.8 as was Crawford with 49.2 after having to take a second cut. 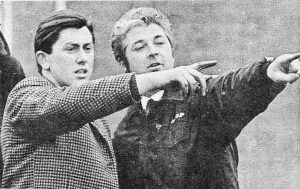 Ronnie McCartney (left) being a bit of a novice at the game (!) gets a few hints from Robert Woodside. 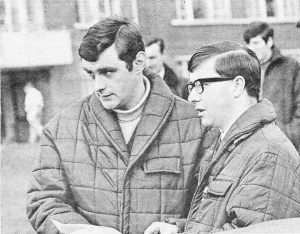 A very good show was being put up by Bobby Brady who was throwing his Cortina 1600 around in great style and at the end of the day had a very respectable score to beat the redoubtable Roland Robinson’s G.T. version of the model. Thus with only the last test to go Ian Woodside had a comfortable but by no means invincible four mark lead over Hagan with Irwin a further four marks behind. Woodside went first and did a very fast looking 56.0 and the issue was more or less settled. Hagan did try very hard indeed but could only reduce the deficit by a second so Woodside’s win was assured. Irwin took another 08 off Hagan’s time and assured him- self of third place and an easy class win over Ronnie McCartney. The Irwin clan were present in force with Andy taking second in his class behind Ted Hobson and Ken being second in the sports car class behind Hagan. Class 1 – General Classification: 1, I. Woodside (MG. Midget) 239.8 marks lost; 2, W. H. Hagan (M.G. Midget) 242.8; 3, C Irwin (BMC Cooper) 245.8. Class 2 – 1 E. Hobson (BMC Mini) 267.6; 2, A. Irwin (BMC Mini) 293.6; 3, I. Ferguson (BMC Mini) 310.4. Class 3 – 1, C. Irwin (BMC Cooper) 245.8; 2, R. J. McCartney (BMC Cooper S) 259.6; 3, V. Lecky (BMC Cooper) 270.0. Class 5 – 1, R. Brady (Cortina 1600) 326.4; 2, R. Robinson (Cortina G.T.) 343.0. Class 6 – 1, W. H. Hagan (M.G. Midget) 242.8; 2, K. Irwin (M.G. Midget) 256.8; 3 C. S. Crawford (M.G Midget) 261.0. Although Eddie Scott (left) and Austin Frazer look worried, they were only present in a spectating capacity. © 2015 Dungannon Motor Club Ltd.